Asymmetrical knitted blouse. Comfortable and stylish knitted blouse, light and delicate to the touch.. Romantic and delicate two-tone sweater, decorated with a braid front, made of pleasant and cool to t.. Comfortable, shirt on narrow straps. Round neck finished with richly decorated lace. Pleasant knit f.. 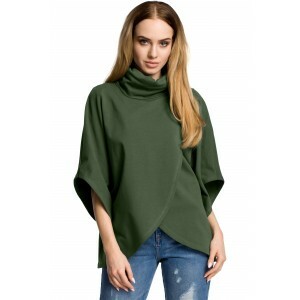 Warm, minimalist sweater with a slit on the sides, fits perfectly with the shirt. The sweater w..
Are you a fan of fashionable and warm sweaters and sweatshirts? Our proposal is a combination of bot..
A blouse made of soft fabric is a good choice for every day to and after work. 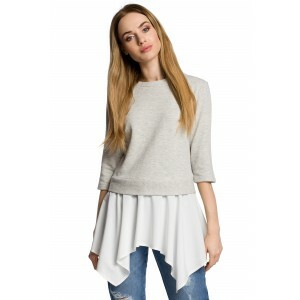 This fashionable prop..
Airy, delicate fabric, loose cut with overlapping and asymmetrically arranged layers gives this smoo..
Feel free and comfortable every day in this loose-cut sweatshirt with bat-length hands per elbow. Th.. 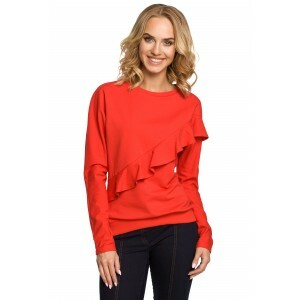 This blouse with a fine pin will delight with its simplicity and charming finishes: a frill at the b.. The combination of two materials: striped knitted fabric and airy fabric in a simple form blouse ide.. This short-sleeved blouse made of knitted sweatshirt with a binding at the waist fits both jeans and.. 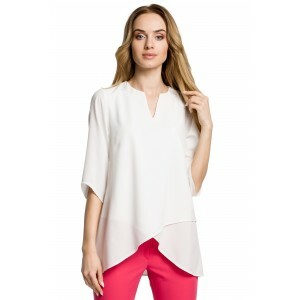 The perfect blouse for everyday jeans, made of nice to the touch knitwear, with kimono, short sleeve..
Frauen T-Shirt mit einem femininen Schnitt. Ausschnitt V schön betonen den Hals und schlanke Fi.. Die attraktive Bluse aus Viskose und Baumwolle, mit V-Ausschnitt, setzt die Figur wunderschön i..